Microsoft has unveiled the Surface Pro 3 at a press event in New York City on 20th May, 2014. 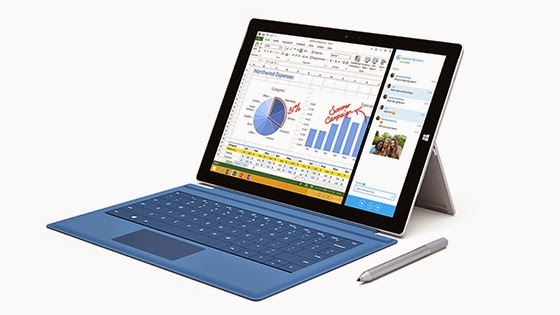 The Surface Pro 3 is one beautiful device with a 12-inch HD display with an aspect ratio of 3:2. It has a resolution of 2160 x 1440 pixels with high contrast ratios. The device also has thinner bezel and silver-black design. The Surface Pro 3 is designed to replace your laptop. It is the thinnest Intel Core product ever created. Microsoft has finally designed the product that can remove the confusion of buying a laptop or a tablet. The Surface Pro 3 is much thinner and lighter than the previous generation devices, it is just 9.9 mm thick and weighs just 800 grams. Like the previous generation Surface Pro, the Surface Pro 3 continues to have a kickstand, but unlike its predecessor the kickstand is now multi-stage. This means that you can position the Surface Pro 3 in the angle that is most convenient for you to use. Microsoft has created a new Type Cover, that magnetically seals itself to the screen. The Type Cover now has a larger track pad. The Type Cover adapts itself at an angle based on the position of the kickstand this balances the device perfectly on your lap. The updated Type Cover will also house a new stylus in a little sleeve. The new stylus used N-trig's integrated pen and touch technology. The pen has a button at the top, pressing which launches the One Note application for quickly take notes. This even works when the Surface Pro 3 is powered off. The Surface Pro 3 will be available for pre-order starting tomorrow in the US. Microsoft hopes to make the Surface Pro 3 available in 26 additional markets outside if the US by the end of August. I'm waiting for this event! thanks Microsoft for new applications!